Follow these steps to learn how to encase acrylic roses. 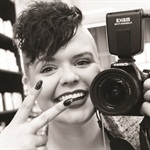 With an Instagram name (@kohokukkia ) that translates to “3-D flowers” in Finnish, Helsinki-based nail tech Liina Leino makes her mark in the industry with a signature style that seamlessly couples raised floral components with a complementary shade. “There is harmony in every set that I do. All the nails might be different from each other in one set but they sync in colors and textures,” she says. “(Clients) don’t really exit their comfort zone in Finland so I really stand out with my decorations.” Follow these steps to see how this nail artist encases acrylic roses. 1. Prep the nails and add one medium bead of white acrylic to the middle of the nail bed. 2. Pat the bead gently so that it forms a thin petal. 3. Make another petal next to the first one using the same technique in Steps 1 and 2. 4. Continue adding petals until there are three layers of them. 5. Create the rose bud with one tiny bead of acrylic and a dotting tool. 6. Add loose petals underneath the rose, using small beads of acrylic. 7. Encapsulate the 3-D artwork with clear acrylic and file the nail very carefully so that you don’t accidentally file the rose. Buff the nail smooth after filing it. 8. Add gel top coat and cure to seal the look. Follow Leino on Instagram: @kohokukkia.